Antique Pedestal Tables were high in fashion at the end of the 18th Century when people moved away from the traditional long solid table to the more finer design standing on a single or twin pedestal base. This form was used on dining tables to much smaller occasional tables from the Late Georgian period to the Regency and Victorian eras. The idea was to make dining more comfortable and intimate, sitting closer together and for furniture to look lighter and delicate. Also because the pedestals were in the centre of the table, they did not get in the way of the chairs, unlike the earlier designs with lots of legs, so more people could sit around the tables more comfortably. A wide, varied amount of woods were used from Mahogany, Satinwood, Rosewood occasionally with decorative Brass inlay to more simple country house English Oak. Have a look below at our lovely examples available for sale. below are a few sold examples, have a look on our tables page for current availability or let us know if any particular style is of interest to you and we can try to find something similar. 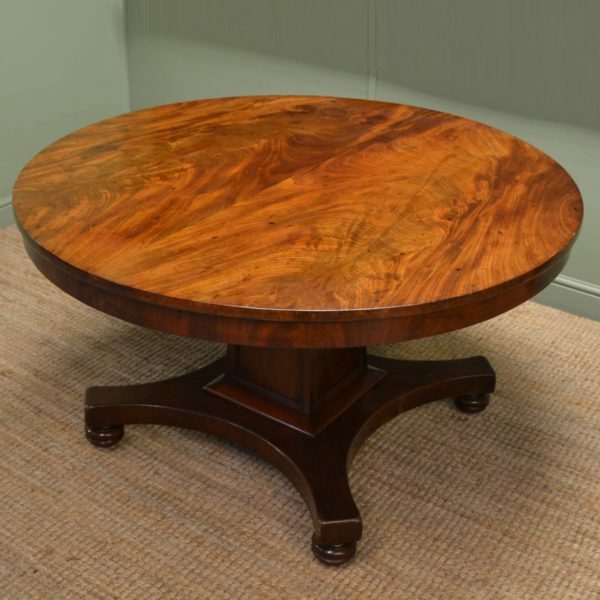 Quality Mahogany Antique ‘D’ End Pedestal Dining Table – Regency Design. 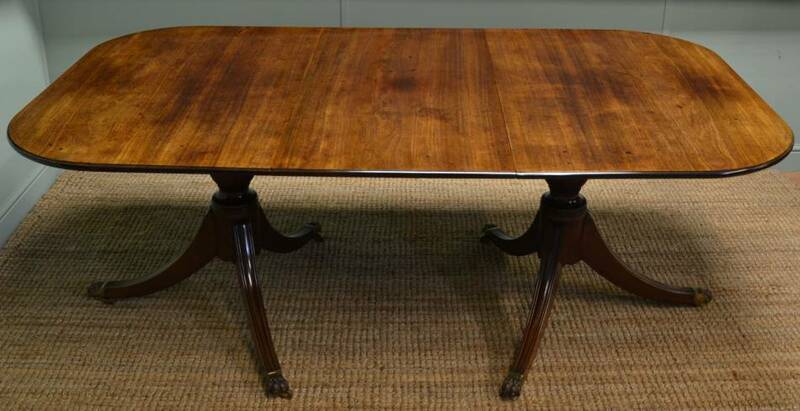 Dating from around 1920, this is a quality mahogany ‘D’ end antique dining table in a typical Regency Design. It consists of two ‘D’ end side tables and a central removable leaf. 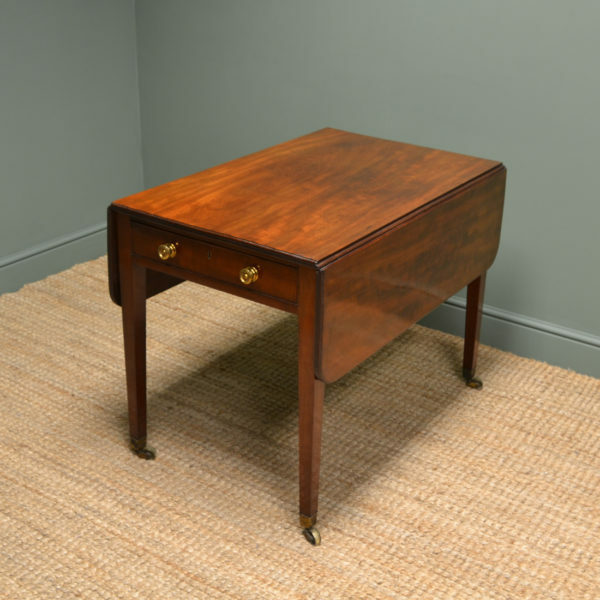 The top is solid mahogany and has reeded edges. Each pedestal has been beautifully turned and has tripod splayed legs finished with brass lion paw castors. 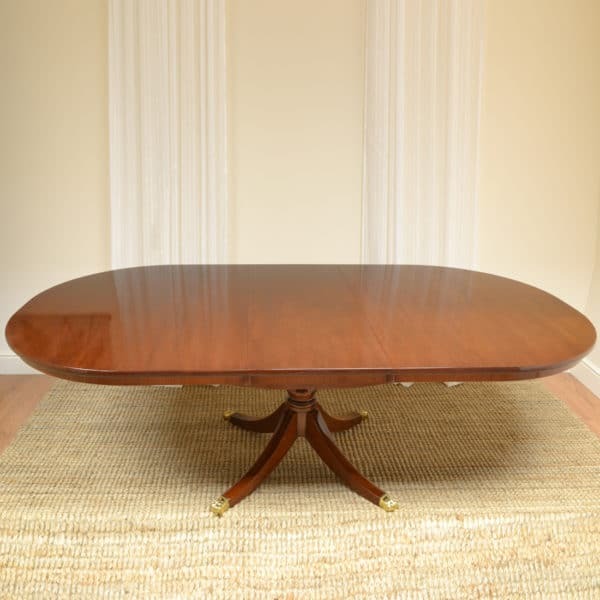 Antique Twin Pillar Regency Golden Mahogany Dining Table. This antique golden mahogany dining Table stands on two pillars and dates from the Regency period, circa 1810. The top is made of solid mahogany, is beautifully figured, has two ‘D’ ends, a central removable leaf and could comfortably sit eight when fully extended. It is a lovely mellow golden shade and its beauty is in its simplicity. The antique dining table benefits from the best quality brass clips from ‘Cope and Collinson’ and stands on wonderfully turned associated twin pillars with tripod splayed legs and quality brass lion paw castors. 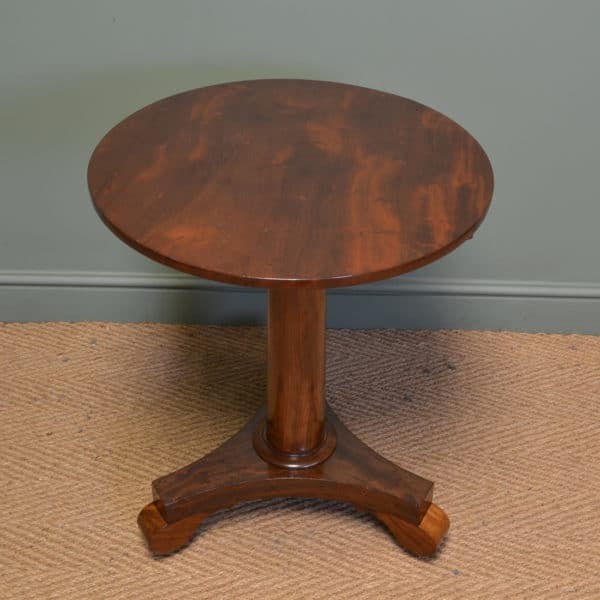 Georgian Mahogany Circular Pedestal Tripod Occasional Table. 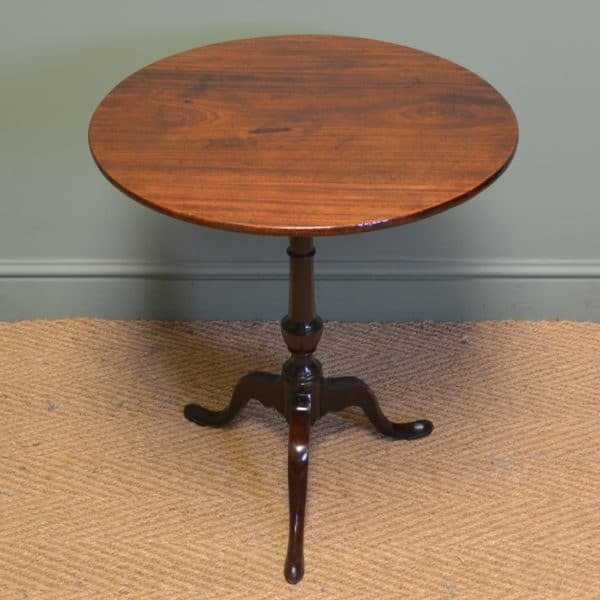 Dating from around 1800 this Georgian Mahogany Circular Tripod Occasional Table has a circular mahogany top that tilts with a brass mechanism. It stands on an attractive shaped pedestal supported by tripod splayed legs and finished with pad feet. 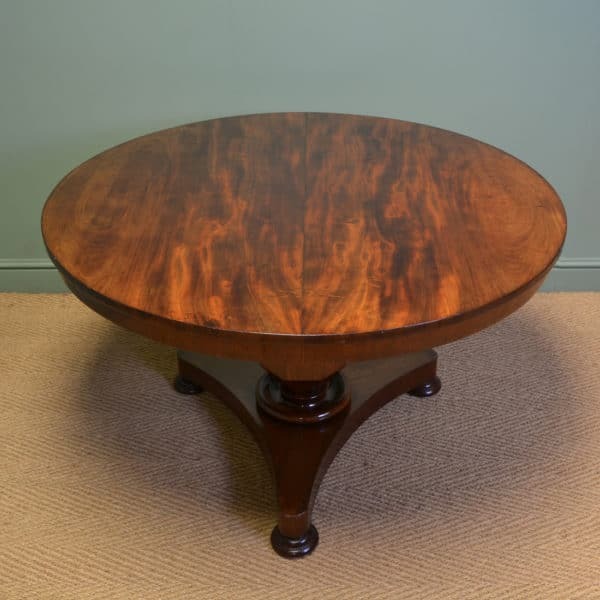 Regency Mahogany Twin Pedestal Antique Dining Table. 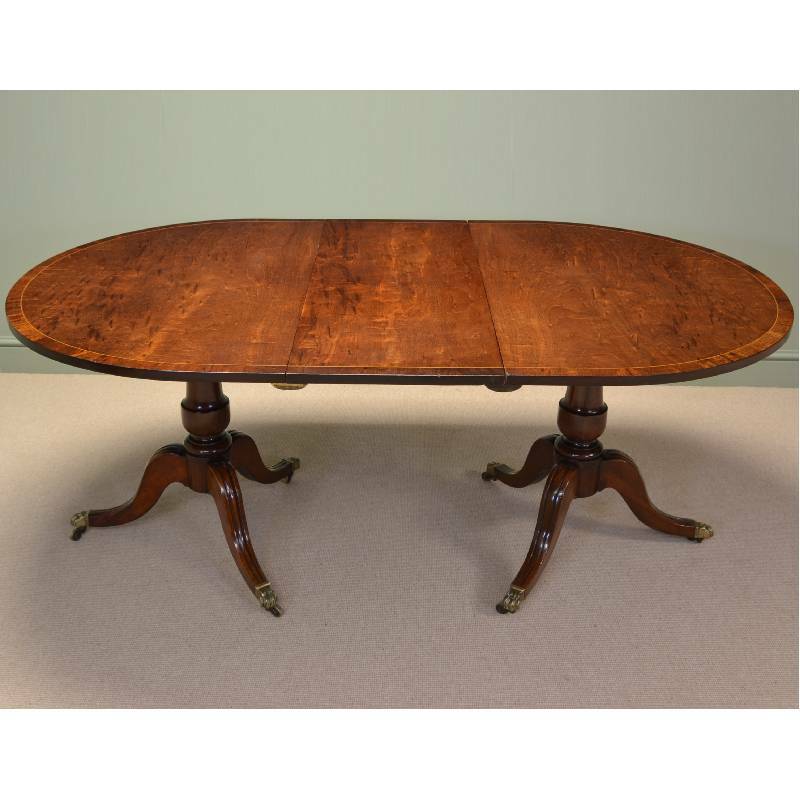 This 19th century Regency twin pedestal antique dining table is made from mahogany. It has a solid mahogany, beautifully figured top with reeded edge and two central leaves which may be removed to aid transportation and positioning. It stands, very securely, on two delightfully turned pedestals each having tripod splayed legs finished with quality lion paw brass castors. This is an excellent example of a fine marriage between a Regency and Edwardian piece resulting in a superb quality antique table which is extremely sturdy, good for everyday use, whilst still having that extra “je ne sais quoi” necessary for those special occasions. 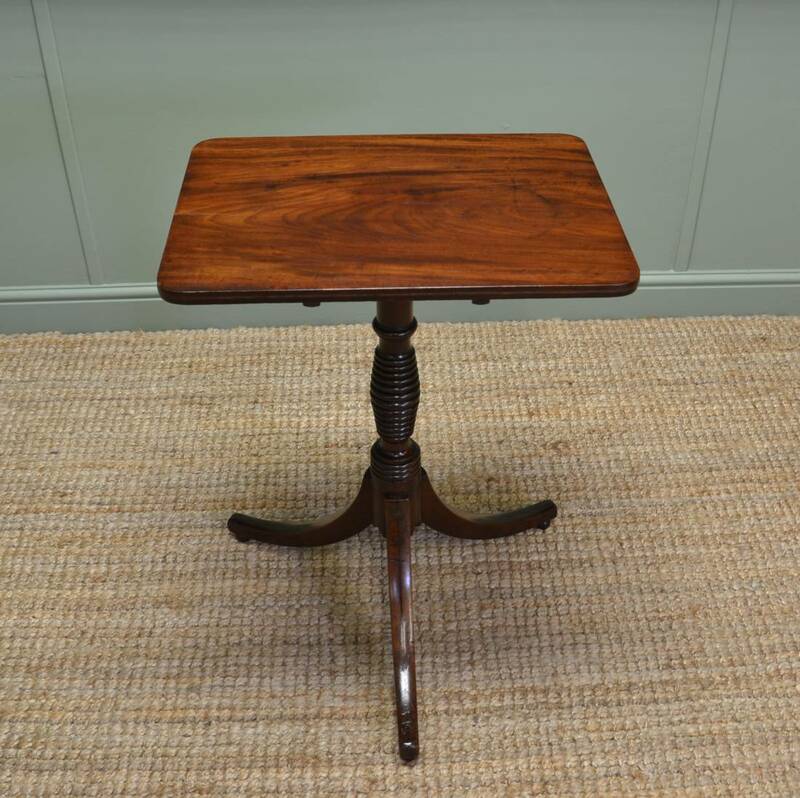 Stunning Quality Regency Pedestal leg, Mahogany Antique ‘D’ End Dining Table. 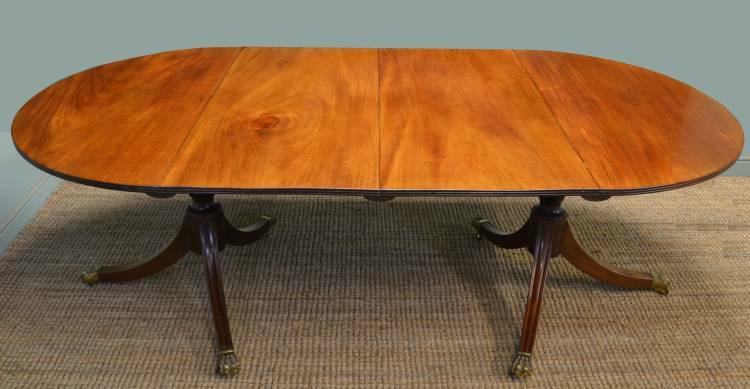 Originating from around 1830 in the Regency period this stunning mahogany antique ‘d’ end dining table is of fabulous quality and full of charm and character. The top consists of two ‘d’ ends with a central removable leaf. The edges are moulded and is held firmly together using brass ‘d’ clips. The Regency top sits on beautifully turned Edwardian pedestals, each having tripod splayed moulded legs with decorative brass lion paw castors. Overall an impressive quality table that is extremely sturdy for one sitting on pedestal legs. 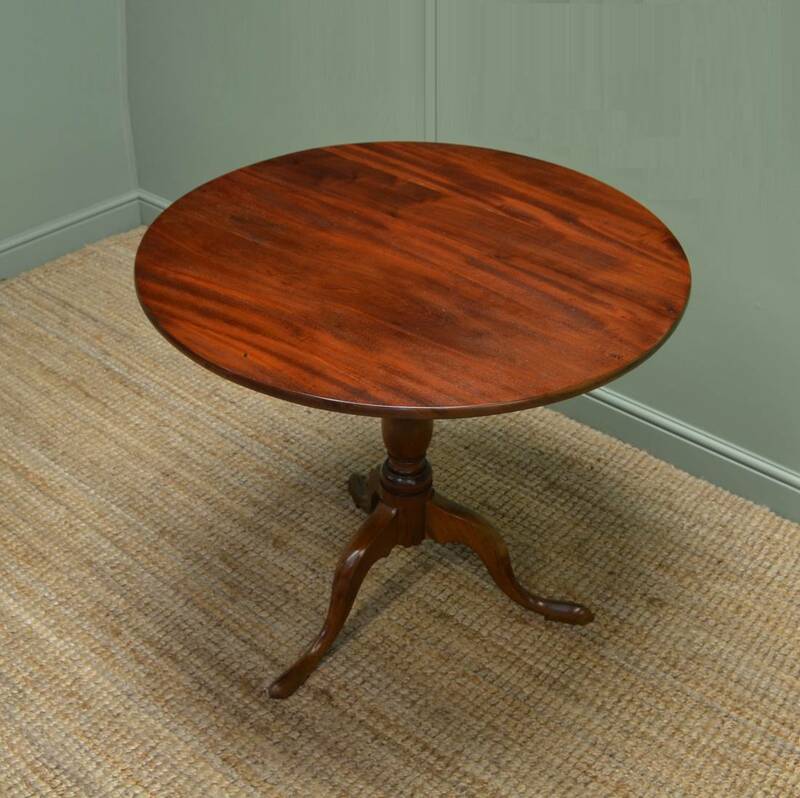 Regency Mahogany Antique Occasional Wine Pedestal Table. 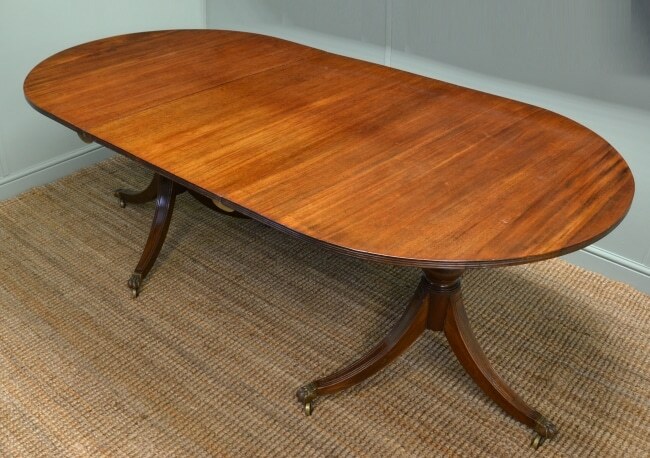 Dating from around 1830 in the Regency period this antique occasional wine table is constructed from mahogany. It has a beautifully figured rectangular top that tilts on the original mechanism. The attractive pedestal has been turned to fashion a honey spoon design and stands on three splayed legs with small turned feet. The table does have some small old repairs, consistent with age and use, but nothing that detracts from its overall beauty. It is a rich medium shade of mahogany with a striking grain, good patina, is in very good condition and has been beautifully cleaned using a traditional form of wax finishing. 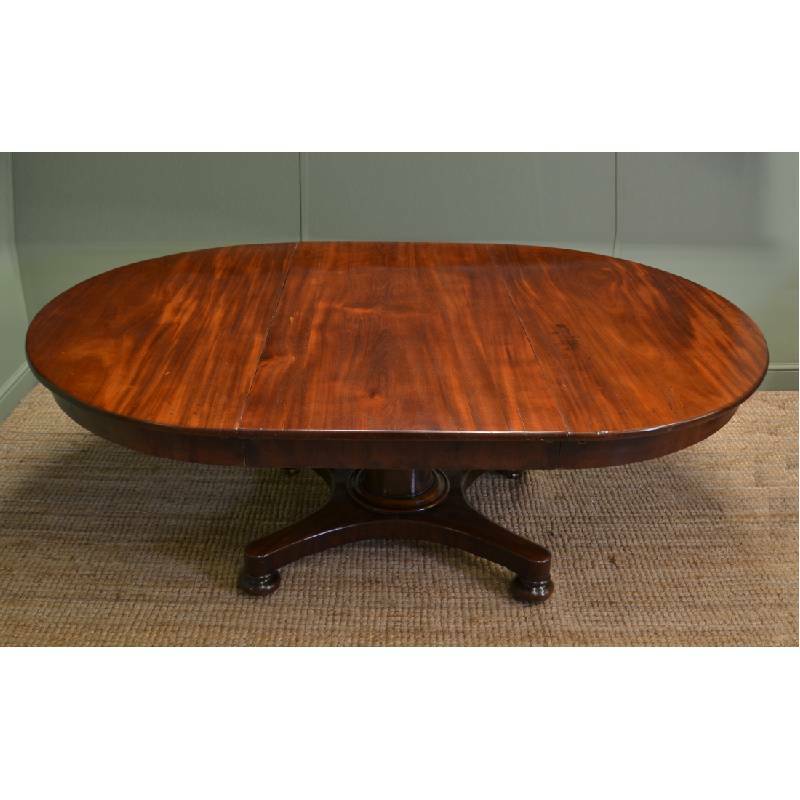 This antique mahogany Victorian pedestal extending dining table dates from around 1840. It has a solid mahogany top with central removable leaf which when used is held in place using brass ‘D’ clips. When closed the table appears almost circular to the naked eye and when extended would seat six diners comfortably. It stands on a beautifully turned pedestal with a quadriform base along with turned bun feet and brass castors.